Debbiedoo's: Antiques Roadshow, I was there! OK NOT really, but I felt like I was. I think my FIL should charge people to come visit his basement. It truly feels like the antiques roadshow. This basement is a bloggers dream of vintage, grain sacks, gadgets, and accessories galore. Not to mention the furniture he has down there. I was a bit overwhelmed and tried to snap as many pictures as I could. I told him don't be surprised if a magazine contacts him. Let me show you just a tad. I really love this fan! HERE is a little tip for you on these bags. My FIL told me his friend gets them from the grocery store...they as you can see are rice bags. I came home with a ton of them. Check out your local grocer and ask them if they have some rice bags, and if you could have them. They throw them out anyhow. This black candle holder, I spied in a corner of his basement. I asked him if I could have it, in a very subtle way of course. All I had to say is, wow this is cool..then he said TAKE it!. My husband asked where was I going to hang it....well as you can see I found the perfect home for it. Not sure how old it is, but I sure like it. I will be sharing with you just a quick project I did last night with my rice bags. See you tomorrow night for the NEWBIE party. 10 cans of chalk paint and more. Go check it out...you have to be in it to win it. Oh wow, you could go shopping down there! The candle holder is perfect for your home & it was nice of him to let you have it. Wow...what a treasure trove. I'd go crazy down there! What an awesome collector your FIL is. Amazing....I love where you put your olden candle holder. Wow is right! What an awesome collection of stuff! Love it and the candle thingy you got! COOL! That does look like a store down there! awesome! Loved the cobwebs in the basement window...reminds me of home! Look at all that great stuff. It is like a store. Great tip on the rice bags. Love the piece he gave you. Going out to cut the grass now in this heat. Must be done. Have you ever seen the show American Pickers on the History Channel? Looks like a place they'd like to look through. Awesome is right! What a great place and the candle holder is just perfect for the space you hung it! Love the grain sacks! I agree with Ricki Jill! I'm afraid I would have had a TERRIBLE time being very subtle! (Not that I need One. More. Thing. haha! I LOVE your FIL's basement! and the "subtle" way you got your great candle holder :o) That is also such a neat tip about the rice bags too! I wonder if that is ANY grocery store? How Fun, Debbie! I bet you had a blast down there. It really was like the Antiques Road show! What a treasure trove your father in law has in his basement, I could spend hours just browsing. I sure could go shopping in that basement. How fun!! I like where you chose to display the candleholder. It is perfect there. Happy weekend. WOW!! Deb!! Your FIL definitely has a treasure trove of goodies!! I enjoyed your Niagra Falls pics. Been there, done that. Many years ago when my sons were young , we went for a week. Stayed on the Canadian side, ate in the towers , did the Maid of the Mist( I almost threw up over the side). It was a great vacation!! Wow -lucky duck!! What an awesome basement AND FIL. :) We are so used to seeing Before & After basements, (which are awesome -don't get me wrong...)but it was refreshing to see this one! How did you manage to tear yourself away, his collection is awesome. Hoooooly Moses Debbie! Any way you can convince him to open an Etsy shop:) That looks like a fun basement! I love the old bottles! What a treasure! Geez. I would have had to wear a bib...I'd have been drooling all over the place down there. Glad you got that neat candle holder! Wow, what wonderful collections ...the scale is amazing! What a great collection! Looks like a museum really. I would love to go shopping there too. Wow, such great stuff. I love that fan. I bet it works too! The candle holder is great and you picked a perfect spot for it. How fun! I can imaginet the excitement of just walking in that room. Not that must have been some fun! I love the fan too! Have a wonderful day! I agree, I want to go shopping in your fil's basement! Love the black candle holder! 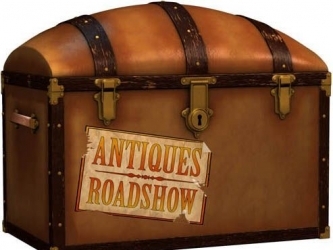 You fooled me, I actually thought you were at the roadshow:) Wow, is all I can say about your dad's collections...love what he gave you and how you displayed it! Hope you had a wonderful vacation(sounds like you did) but so glad to have you back! Oh Debbie, it truly would be a bloggers dream to shop your father-in-law's basement! Congrats on your home being featured in Country Woman. Your home is definitely magazine worthy. Have a wonderful day and stay cool. Wow! Talk about a treasure trove! Can't wait to see what you create with your rice bags. Wow that's a lot of stuff! How fun to be able to go through all of it. Thanks everyone for your sweet comments, I am sure my fil will enjoy hearing about them.